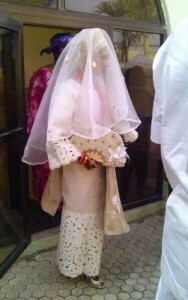 New reports circulating has it that Mavins Recording artiste, Di’Ja secretly got married in Kano. According to a recent post online, the singer wedded her man few days back in a low profiled event. Although Di’Ja’s manager has refuted the claims saying she never had any wedding or engagement ceremony. Rabbi, her manager, further disclosed that the wedding pictures which has gone viral was from a music video shoot.